Decoding Blockchain: What Is It and How Can It Be Used? It is December 5th 2017, 4:45pm. It is a dark, cold and windy day in London. BBC reports interesting goings-on: “CryptoKitties craze slows down transactions on Ethereum”. Really? Really. That was the news. Essentially, Blockchain technology is used to breed and trade digital kitties for significant amounts of ether. The transaction values are not the astonishing part. Interesting is that Blockchain became main-stream enough for some major news outlets to pick up the story. January 10th 2018. Kodak’s stock price surged by a factor of 3 after they announced to use Blockchain for digital rights management. There are many papers and blogs about the mechanics of Blockchain. So many that the true potential of the technology, or the evaluation thereof, is lost in the details. What it is, if it is worth it, intricate details about its scalability and throughput, marketing about ICOs (initial coin offerings), and many more. Why – What’s the promise? Simplification is a central theme. Originally Satoshi Nakamoto published a proposition for a different way of doing electronic payments. “A purely peer-to-peer version of electronic cash.” It would “allow online payments to be sent directly from one party to another without going through a financial institution”. And bitcoin was born. Blockchain promises to help exchange objects of value between organisations (or parties) in a trusted way. People who don’t trust each other and, in many cases, don’t even know each other. Without the need for a governing, central authority. This focus on simplification reduces intermediaries, and it does payments more directly via peer-to-peer networks. It makes the entire system more transparent, as everyone has a copy of the ledger. 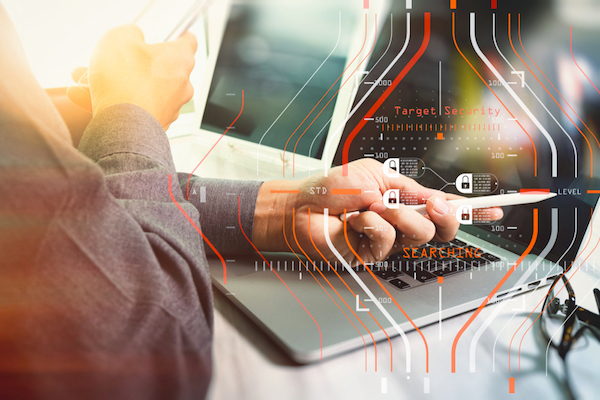 It ensures trust in an environment of potentially unknown and untrusted participants. So, the key question is: How can we transfer this concept into different places, or industries? Is it even transferrable? We, our trailblazing customers and others have thought about this intensively. It is not simple to find a Blockchain use case in its truest sense. And it doesn’t have a binary answer either. Conversely, not having a Blockchain use case in its truest sense does not mean it should not be implemented on Blockchain. Further below we introduce a litmus test to help you decide whether or not a specific use case lends itself as a Blockchain use case. But before that, let’s dissect Blockchain itself. What’s inside? I quite liked the following HBR write-up. It translated the computer science-jargon often used, particularly well into five principles written in a less technical language. Blockchain is the technical concept underlying – for example – Bitcoin. Bitcoin in this context is the use case. Blockchain exists in multiple technologies, each one of them coming with their own up- and down-sides. Examples are Ethereum, Hyperledger, the Bitcoin Blockchain, and others. As pointed out above. HBR brilliantly summed up the gist behind blockchain in non-technical terms. Blockchain as a technology comes with its own set of limitations. Of course. It is new, has not matured yet, and is still an intense subject of research & development. Some of the research areas are more foundational topics like (energy) efficiency (proof of work vs. proof of stake), throughput or scalability (for example sharding). Some of them are based on more practical aspects, like being able to limit visibility of data to specific participants. We believe the idea is transferrable. It is not a binary truth and there are and will be shades of Blockchain applications. Each one might make sense in their own right. 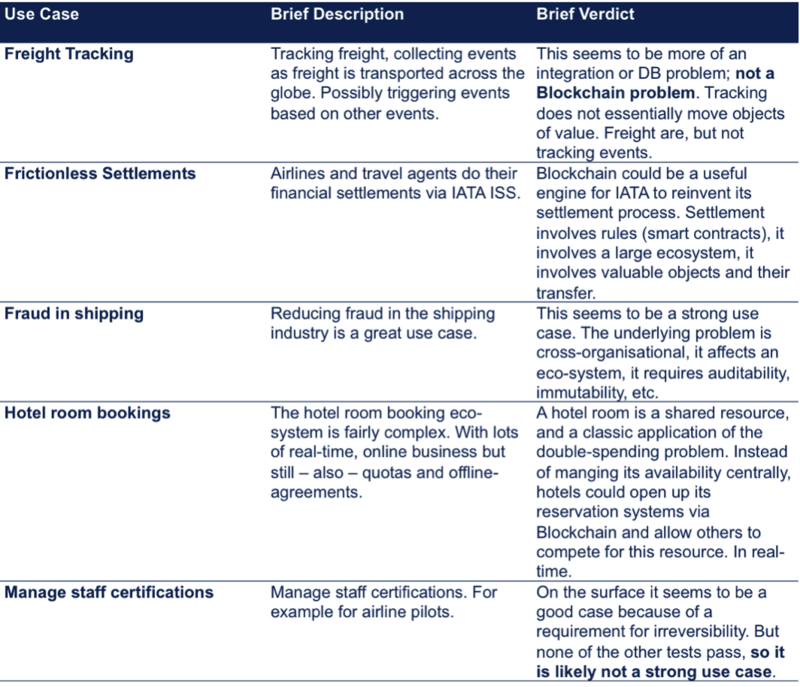 Although not all of them might be true Blockchain applications – if you want to tick all the “Blockchain boxes”. Blockchain is a technology to help solve a particular problem – with its own set of advantages and disadvantages. It may be able to solve a specific problem technically, but may still not be the right technology. Remember: to the hammer, every problem looks like a nail. 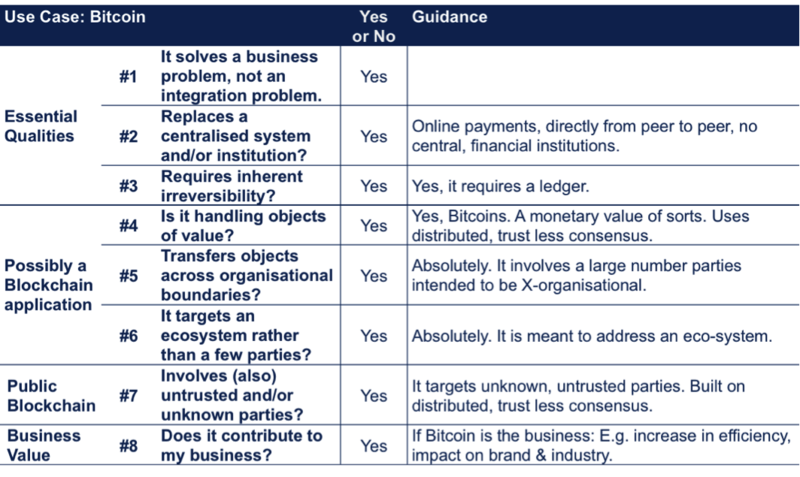 It is not simple to determine whether a use case is right for Blockchain. Because of that we decided to put together a guide – in the form of a simple litmus-test. Apply this test to the problem you are trying to solve, and answer each question with either Yes or No. The sum of it all will give you an indication whether the problem you are trying to solve is actually a Blockchain problem. Tests #1-3: Those tests represent essential characteristics. If any of the questions no. 1 to 3 are answered with No, the problem is likely not a Blockchain problem and I would not go ahead and build this solution on Blockchain. Tests #4-6: Tests #4 to 6 indicate, from my perspective, a set of characteristics that should – at minimum – be present to justify a (private) Blockchain. If any of the questions are answered with No you – strictly speaking – do not have a Blockchain application. However, going ahead with Blockchain as technology may still make sense. Test #7: If #7 is answered with Yes it may indicate suitability, or even a need, for a public Blockchain. And finally, does it solve a real problem? So far so good. If you got to this level you are likely looking at a problem Blockchain is a suitable solution for. Now ask yourself question #8 - if the problem you are solving contributes to your business. If this question can be answered with Yes, it is time to get started with a Minimum Valuable Product. Now, let’s test it. Our first test-case – an obvious one is Bitcoin. Let’s see if this model stacks up. It is obvious that Bitcoin is an ideal use case for this. But then Bitcoin has been built as a use case. Specifically. This is no surprise. Let’s look at another example. Let’s assume we are manging financial settlements across a supply chain. 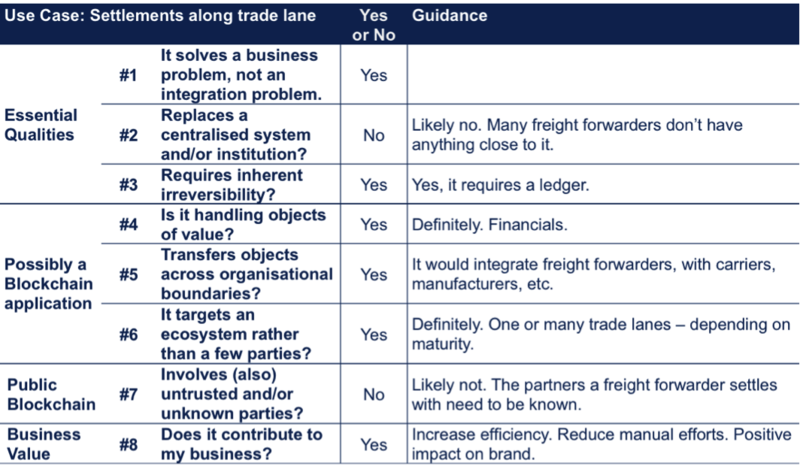 Example: Freight forwarders settle their financial contractual agreements with their transportation partners along a trade lane, and in turn theirs with theirs. We assume that we will use a Blockchain technology that allows us to manage visibility of data, depending on the authorisation of people. As you can see. It is a strong case, but not a classic Blockchain use case. Verdict: It could greatly improve administrational efficiency along complex supply chains. But it is not a classic Blockchain use case because it does not tick all the boxes. We have looked at a few more scenarios. For some of them it seems to stack up, for some of them it does not. What if you're a Salesforce customer? 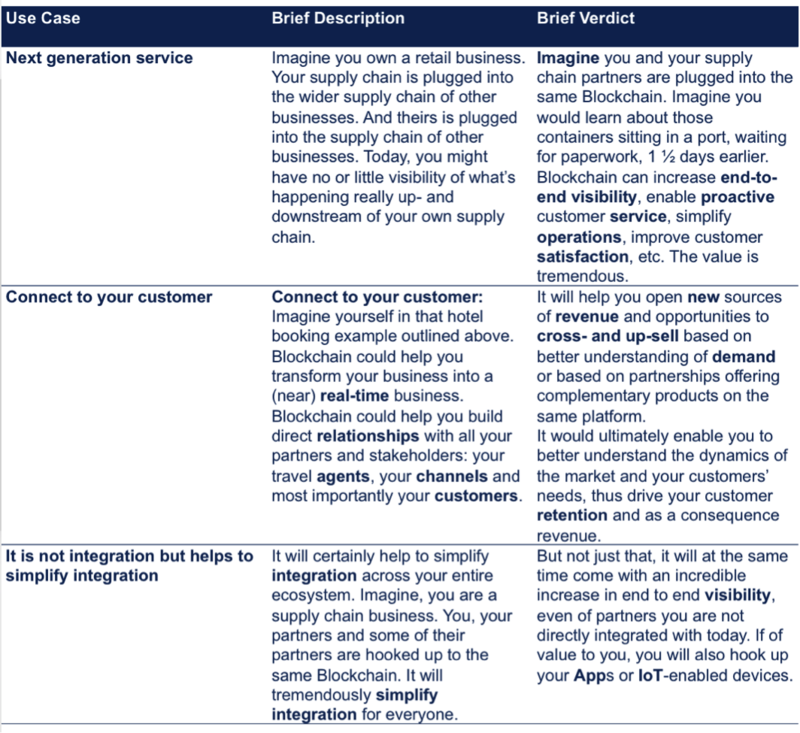 If you already are a Salesforce customer, perhaps some of these use cases will inspire you. The opportunity associated with Blockchain is tremendous. Let us help you find the right use case to get started with by contacting us. Now is the time. We have got industry and technical experts who care for your business and are eager to help. Together with our ohana of customers and partners, Salesforce is driving the creation of nearly 3.3 million new jobs by 2022. Learn the skills you need to transform your company, earn credentials that grow your career, and connect with a global movement of Trailblazers to continue learning together. Visit Trailhead, the fun way to learn Salesforce.